From A.D. 700 to 1600 the ancient empires of Ghana (700-1100), Mali (800-1550) and Songhay (1300-1600) controlled vast areas of West Africa (see map and time line). Although each empire rose to assert its power, they coexisted independently for centuries. At its peak (1200-1300), the Mali Empire covered an area that encompasses significant portions of the present-day country of Mali, southern and western Mauritania and Senegal. Note that the old kingdoms of Mali and Ghana are not the present-day countries of Mali and Ghana. Predominately a savannah, this vast region has two seasons--a rainy season and a dry season, the latter being the longer of the two. The Mande-speaking peoples living in present-day Mali (Bamana, Senufo and Dogon peoples) have inhabited this area since the days of the Mali Empire. Today, Mande-speaking peoples live in almost all parts of West Africa, having migrated in search of trade or having been displaced by war or climatic conditions. Their migrations are indicative of the mobility of African peoples in many parts of Africa. Human histories are reconstructed from a variety of sources--written, oral and archaeological. Each contributes a different element to the overall story. The few written accounts about ancient Mali were recorded by Arab travelers and scholars. One of the most famous travelogues is Rihlah by the African-born Ibn Battuta (1304-1368/9), a great Arab traveler of the time. Rihlah describes life in Mali between 1352 and 1353/4 and records his travels to Anatolia (current-day Turkey), Crimea, east Africa, Persia (present-day Iran), India, Cylon, Sumatra, North Africa and perhaps China. Although other written accounts of the ancient West African empires exist, Ibn Battuta is one of the few who actually traveled to this area and wrote from personal experience. Oral histories are the traditional means by which people typically pass on their histories. Oral sources of African histories included poems, praise songs, and accounts of past events. Official oral historians, known as griots, recorded the peoples' and courts' histories. The epic poem "Sundiata" (also spelled Sundjata) chronicles the life of Sundiata Keita (ca. 1210-1260), the son of the king who defeated the Ghana king Sumanguru and founded the empire of Mali. Archaeology offers the most tangible evidence of earlier civilizations. Although archaeology has already provided invaluable information pertaining to the life styles and skills of the peoples from this region of West Africa, the archaeological record is still incomplete. The figurative sculptures featured in this resource furnish one part of the historical puzzle of this region. These handsome terracotta sculptures are from the Inland Niger Delta region near Djenne (pronounced JEH-nay; also spelled Jenne), one of several important trading cities that grew and developed during the Mali Empire. The emergence of the three centralized states at given points in history can be attributed to the coupling of the lucrative gold trade from the Sudan with the salt brought by North African Muslim traders. Ghana was the richest of the three in c. 1150, owing its wealth primarily to the vast gold fields of Buri and Bambak. The acceptance of Islam by the rulers of Ghana, Mali and Songhay (also spelled Songhey and Songhai) in c. 1000 encouraged trade between the empires and North Africa. The introduction of Islam also instituted more cosmopolitan social structures, such as universities, world religions and, especially, centralized state systems and military forces. At its peak, the Mali Empire extended across West Africa to the Atlantic Ocean and incorporated an estimated 40 to 50 million people. The administration of such an enormous territory was formidable and relied on the establishment of a government sensitive to the diversity of the land, population and cultures and accepting of the indigenous rulers and their customs. What distinguished the empires of West Africa, particularly Mali and later Songhay, was their ability to centralize political and military power while allowing the local rulers to maintain their identities along side Islam. The imperial powers were located in active commercial centers like Djenne, Timbuktu and Gao. The wealth of the Mali Empire is illustrated by the Mali emperor Mansa Musa's pilgrimage to Mecca in 1324. His entourage reportedly included thousands of soldiers, officials and attendants, 100 camels each carrying 300 pounds of gold, and 500 maids and slaves to serve Mansa Musa's senior wife. Once in Egypt, Mansa Musa paid homage to the sultan with gifts of gold. He distributed so much gold that its value was decreased by 10 to 25 percent. Commerce promoted the development of public works, including the building of social and religious structures. The imperial rulers ordered mosques constructed and palaces converted into mosques. Mosques were often identified with the cities where they were built and the rulers who commissioned their construction. Using established building techniques, architects and builders increased the size of the mosques to accommodate a larger Muslim population and underscore the importance of Islam. The cities of Gao, Djenne and Timbuktu boasted large mosques. Mosques were constructed from specially prepared mixtures of mud. During the 19th century some of these historical structures fell into disrepair and eventually were replaced by newer structures. Djenne had three mosques. The earliest dated to the 13th century and lasted into the early 19th century. 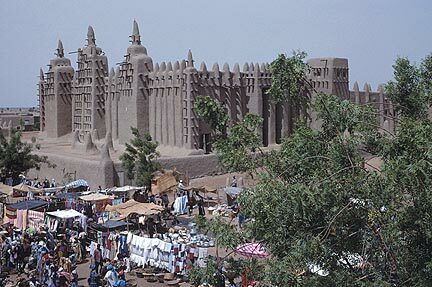 During the 19th century Djenne ruler Sheik Amadou built a second mosque and allowed the first to deteriorate. The third mosque was built under the guidance of Ismaila Traoré, head of the builders' guild, on the site of the first. Constructed of blocks made from a mixture of rice husks, earth and water that was allowed to ferment, it is an impressive structure, four stories high, with three minarets almost 60 feet high. The spires are topped with ostrich eggs symbolic of good fortune and fertility. The annual maintenance of the mosque requires thousands of men climb the walls and replaster the cracks in the walls. Left unattended, the mosque would deteriorate rapidly.